A couple of weeks ago, the historian David Starkey made a comment on the riots. He has been widely denounced for what he said, not least because he referred approvingly to Enoch Powell. Professor Starkey is able to defend himself. What concerns the Libertarian Alliance is how our increasingly totalitarian ruling class regards Enoch Powell as some kind of Emanuel Goldstein. Even if nothing controversial in itself is said, to speak of him without visible and ritualistic loathing will bring you under suspicion of thought crime. During his long political career, he was notable for his defence of the British Constitution and of the traditional liberties that it embodied. He was an anti-socialist and an anti-corporatist. He resigned from one Conservative Government that was soft on spending and inflation. He helped bring down another that was a national disaster. He played an important part in stopping further “reforms” to the House of Lords until the year of his death. The public reason for why he is so hated by our modern ruling class is that he opposed mass-immigration and multiculturalism. Since the legitimising ideology of this ruling class is based on the claim that “diversity” is strength, and the threat of utter destruction for anyone who disagrees, his opposition might be sufficient reason for his being hated. Even so, much of the hatred rests on the envy of men and women who are themselves uneducated and illiterate and dishonourable and sordid and incompetent. 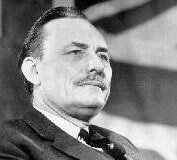 Enoch Powell is hated in part because he dissented from the established view on immigration, but also because he was a shining example of what a statesman ought to be – and of what a statesman often approached to in this country before the present clique took over. I am proud to say that the Libertarian Alliance frequently invited him to speak at its meetings in the 1980s and 1990s, and that we published several articles by him. Of particular importance among these articles is the attack that he made in 1984 on the Drug Trafficking Offences Bill and the principle that it brought into English law of asset forfeiture without conviction. (See Hon. J. Enoch Powell, The Drug Trafficking Act versus Natural Justice (Introduction by Dr. Chris R. Tame), The Libertarian Alliance, 1987, ISBN: 0948317 97 3). When Enoch Powell died in 1998, our Director, Chris R. Tame, paid his respects by standing outside the crowded memorial service. I was not able to join him on this occasion. But I did recently make Enoch Powell the directing genius of my Churchill Memorandum, which is an alternative history novel set in a world of 1959 where the Second World War had not happened. I feel honoured to have met him and heard him speak, and to possess signed copies of his books. And I rejoice in directing an organisation with which, however slightly, he was connected. A hundred years from now, no one will remember the corrupt nonentities who are now using Enoch Powell as a stick for beating David Starkey. Equally, a hundred years from now, men will still be reading Enoch Powell for pleasure and instruction.